This delicious maple dijon sauce is perfect for a meat marinade, a salad dressing, dip or any other use you can think of! Keto, sugar-free, paleo, low-carb, vegan. Can you say flavor explosion?! I am someone who gets bored of eating the same things incredibly quickly. I can only stand the same flavor profile for one meal (maybe two), before I just need a change of pace. I’ve been eating salmon a lot lately, because it helps immensely with my dry eyes. I get really bored of the bland flavor and sometimes almost dread eating it, unless of course a good sauce or seasoning is involved. If you’re anything like me, then you know that flavor plays a HUGE role in whether meals are an enjoyable, flavor-party in your mouth, or a boring old bland-fest. 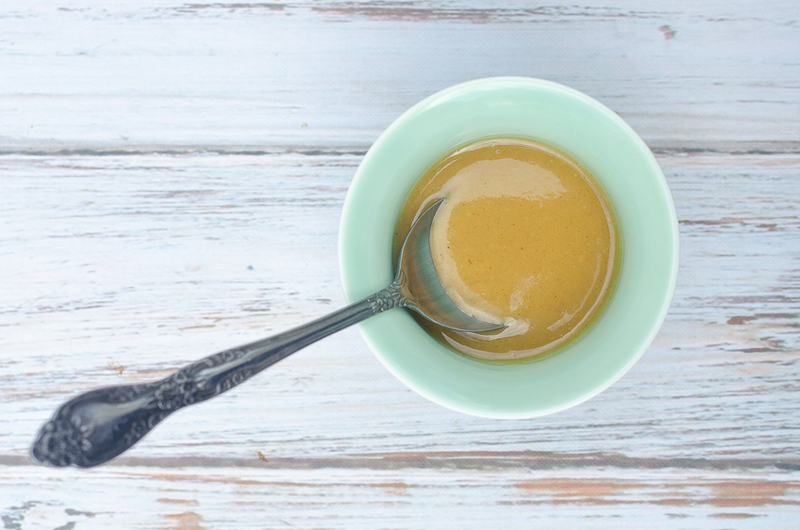 This maple dijon sauce has definitely reached flavor-party status in my book. It’s sweet, tangy, salty and super delicious! It goes incredibly well with salmon, or any other meat or veggie for that matter. This maple dijon sauce is great for so many reasons, but first and foremost, it takes just two minutes to assemble. Seriously. All you have to do is mix maple syrup (sugar-free for low-carb!) with dijon mustard, salt and pepper. Yes, that is honestly the recipe! It doesn’t get much easier than that. If you are pressed for time and always seem to forgo sauce because you don’t have time, well you no longer need to sacrifice. This sauce is also great because it requires no blending, food processing or shaking. Less cleanup, and if you mix it directly in a storage container, well, there’s zero cleanup required as well. It’s perfect as a marinade, a sauce you can add to meat before or after cooking, as a dip for veggies, and in so many other ways as well! Simply store in the fridge for up to a week, and use whenever your tastebuds demand some. How do I thin out the sauce to use it as a dressing? Easy peasy! Just add a little bit of apple cider vinegar (a tablespoon or so), and you have a delicious salad dressing. You can also add some extra virgin olive oil if you want an even thinner consistency. If it’s no longer sweet enough for you, add a bit more maple syrup to the mix. How about making it thicker? The consistency is pretty spot on as a sauce in my mind, but if you want to thicken it up, you can use a teeny bit of coconut flour or another gluten-free flour of your choice. I do not recommend regular flour if you’re not going to cook your cause, because you are always supposed to cook it before consuming. If you give this maple dijon sauce a try, please let me know what you think in the comments below. Also be sure to follow me on Facebook and Pinterest so you don’t miss a recipe! 3 tablespoons maple syrup or sugar-free maple syrup I like the Choc zero brand maple syrup for low-carb. Mix ingredients together in a bowl, and stir until texture is smooth. Store covered in the fridge for up to one week, or use immediately.